Exit row seats and emotional service animals gave me an idea for a new airline. On a recent flight, I had an exit row seat. You likely know what this means: the flight attendant will issue the usual statement that you must be willing and able to perform the duties required of an exit row seat in case of an emergency. A quick visual survey of my fellow exit row seat passengers revealed that even though everyone gave the required verbal “Yes” to the question, not everyone was truly capable of completing the duties, which include opening the emergency exit door and lifting or moving the door out of the way (see below – I decided to look them up). This isn’t being mean but a simple and fairly obvious observation given the movement quality of the passengers as they walked down the aisle and the surprising difficulty a few of my seat mates had getting their carry-ons into the overhead bins. Emergencies don’t really care if they hurt your feelings. There’s this growing problem of egregiously entitled people abusing emotional service animal policies simply to get their pets on the plane with them. There are legitimate cases of PTSD and other conditions justifying the existence of emotional service animals. But no one can reasonably argue against the fact that this system is rampant with abuse by people who think their pet should be allowed to go anywhere they go. 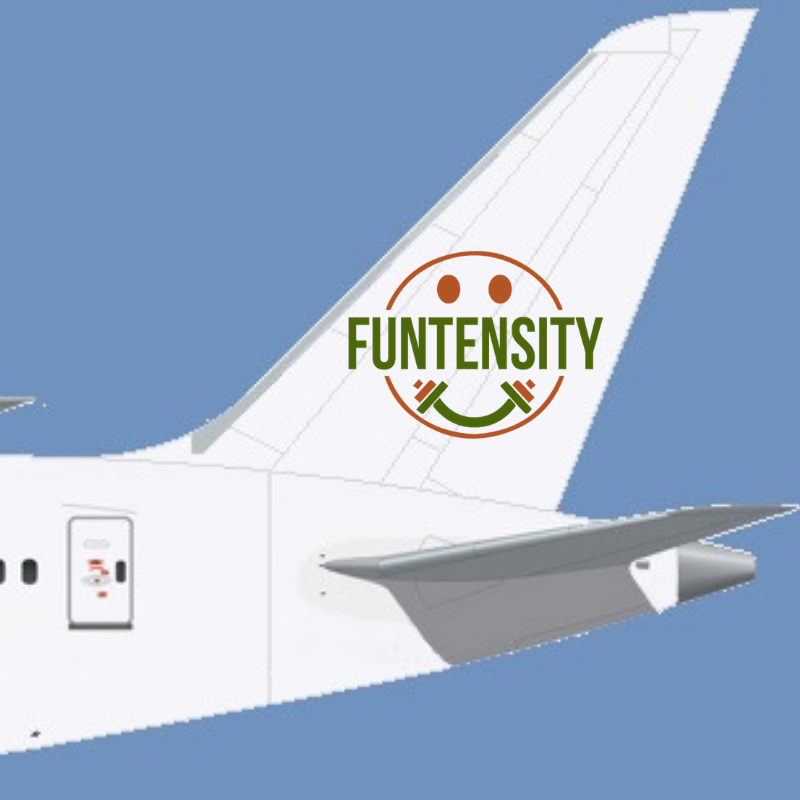 All of this led to an idea for “Funtensity Airlines.” The key features of this airline would be as follows. If you want an exit row seat, you need to complete the fitness test before boarding that proves you are capable of completing the duties required for an exit row seat. The only service animal allowed is a Funtensity Rubber Chicken. Bend down, lift and move a sample emergency exit door back and forth a short distance several times. Run (written in obscure language above in the instruction to move “expeditiously”) a short distance and read and follow a short series of instructions accurately. Lift any carry-on you plan to bring onto the plane over your head successfully without assistance. Fail any of the test items, no exit row seat for you. Your fellow passengers need to know you are up to the task of helping in an emergency. Nothing personal. We’ll be happy to assist you with a non-exit row seat. This one is simple. There’s only one potential service animal allowed, and we provide it for you. Upon request, all passengers will be entitled to a Funtensity Rubber Chicken. It really is all the emotional support you would need. 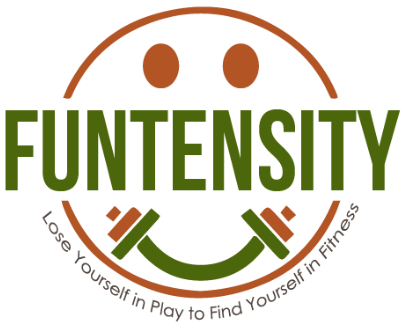 I’ve seen people of all ages and abilities – and even big, burly dudes who rarely smile – smile, laugh, and experience the lightness of being that comes from playing with the Funtensity Rubber Chicken. No more pet waste. No more pet allergy problems. No more barking. No more overly entitled pet owners. 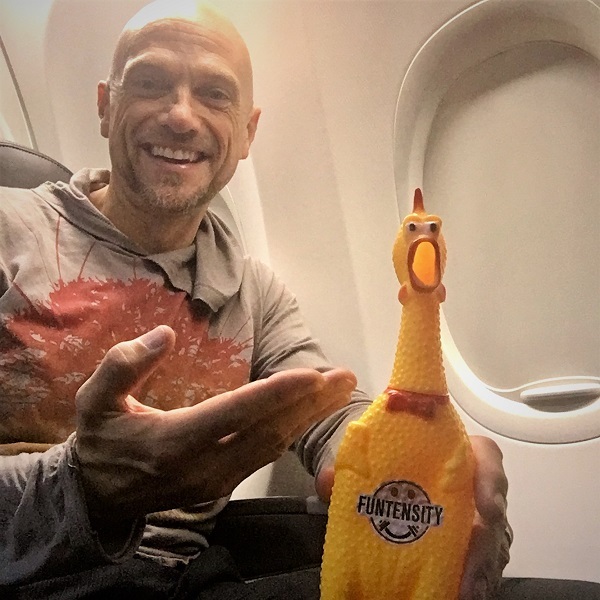 Everyone can take home a free Funtensity Rubber Chicken for some emotional support whenever you need it on or off the plane. This humorous, satirical little idea for a new airline nevertheless contains a kernel of truth. Sometimes life asks you to be physically ready to successfully handle an emergency. Handle the emergency well or the emergency will handle you.